Hi, I’m Louise, mum to Mimi (5) and Buddy (3), wife of Husband. We first took Mimi abroad at five months old and have done a fair bit of travelling both abroad on holidays and in the UK to see my far-flung family. There is quite a big checklist with camping! Making sure your car is up to scratch is one of them. We are members of AA Cars so before we go anywhere we check that are car is up to the job (if you’re looking for a camping car then they have a good used car section too) and use their car checklist to ensure that we won’t be stranded before our holiday has even started. Check how you’ll store all your gear! You’ll want your boot to pack a far bit in without compromising the comfort or view via the back window. Always have a quick dry run of packing. Check your tent! If you’ve got a garden or green space and haven’t used your tent for a while then get it out to air it, check for any tears and waterproof spray it while it is out! Check your campsite reviews. See what is included in the cost, what amenities they have on site. It’s not a good start to the camping day if you can’t make a cuppa! So here is how we got on during our camping trip! 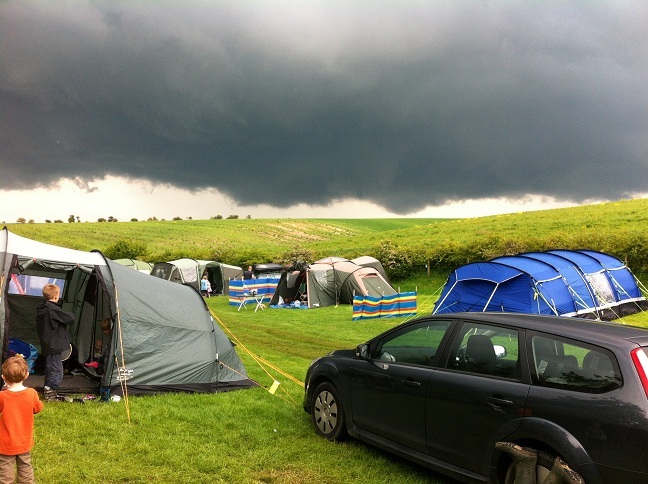 It’s fair to say that our first family camping trip was not a wholesale success. So much so that Husband has rated it 3/10, although I think that’s a bit harsh. The forecast told us to expect rain and perhaps some wind, and that is indeed what we got. Despite setting off in clear skies and it being nice enough weather for a walk along the beach with some friends holidaying nearby before heading to the campsite, Mother Nature, it seemed, was not on our side for the camping bit of our trip. We arrived at the site through torrential rain. You know, the kind that makes splats an inch across when it hits the windscreen. After being quickly and efficiently checked in during a dry spell we drove down to our pitch only for another massive cloud burst to appear. So out came the picnic and we sat in the increasingly steamy car, nibbling on sandwiches and wondering when it would let up. After 10 minutes it had slowed to just steady heavy rain, so we decided we may as well get on with putting up the tent – for only the second time. I’m proud to say we managed it quite well despite the continuing rain, so by the time the friends we were camping with arrived, the tent was up and we were successfully masquerading as competant campers. Night 1: What’s that coming over the hill? Throughout out the rest of the afternoon we completed our unpacking, explored the site (which is fab by the way, but I’ll write about that separately) and dodged a few more deluges. Each was followed by a spike in temperature and, at times, some pretty warm sunshine. We even managed a trip to the playground in my Ray Bans, coffee in hand. A lovely evening ensued, with the children hunting bugs and us grown ups enjoying a glass or two by the firepit. Overnight was not quite so good though, with more heavy rain which disturbed the children, and a child in the tent opposite who was either inconsolable, or not being consoled. We couldn’t really tell which and, to be frank, got past caring. Suffice to say that Thursday dawned with us bleary eyed and cranky. Thursday was spent exploring Scarborough and the weather seemed not to be able to make up its mind. Sea frets blew in and out, mist hung over the valley and while we were at the castle a man from English Heritage arrived to run down the flag. Not, he assured us, because the Duke of Edinburgh had died but because a storm had been forecast for that evening. Oh good. Thursday evening became damp and dreary, so we snuggled the children into bed at a decent time and took to ours for a spot of reading. Unfortunately the wind soon got up and Mimi was woken by the noise of the gtent billowing (yes, we’d tightened the guy ropes and checked the pegs). In the end we moved her into our room for the night – reinforcing my logic of getting a tent with two double bedrooms divided only by a sheet rather than being totally separate. The rain continued until about 1am, but was swiftly replaced by loud thunderclaps and more apparently-gale-force winds. But despite all of this, all four of us got a better night’s sleep. To put that in context though, a better night’s sleep involved Husband threatening to pack up and leave straight away – at 4am. I managed to persuade him to wait a while, and bought myself and the sleeping children only another 2.5 hours before Husband cracked and got down to the job of packing up. We were off the site by 8.30am, via a brief stop at the toilet block to get everyone’s teeth and faces clean. He didn’t even make me a coffee before packing away the gas stove and kettle. It was still raining though, so absolutely everything was sopping by the time he got it to the car. He hadn’t even packed a waterproof coat – despite the forecast – so I at least got to snigger at the rain dripping off his hair and nose. So me and the children had a pretty good time – bug hunting, donkey rides, exploring a castle and seeing all of the animals at the campsite seemed to outweigh any problems with the weather as far as the children are concerned. But Husband is still maintaining a grumpy indifference to the whole experience, claiming that if we’d only borrowed the family tent it would be going straight back. It’s tough though, because we’re off again in four weeks to camp with my parents. If you could cross your fingers for better weather I’d be much obliged. So where and how are you going on your travels this summer?